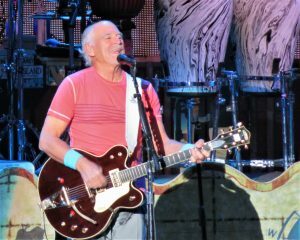 It was a long time coming for Charm City Parrot Heads to get a hometown show, and Jimmy Buffett & the Coral Reefer Band’s show on Friday was worth the wait. The man who built an empire based on laid-back Key West boat culture drew a full house at Royal Farms Arena, with fans decked out in grass skirts, coconut bras and wild hats of all varieties. The crowd made it an all day affair with a Parrot Head party outside the arena where the Margaritas and Landshark Lagers flowed while Buffett tribute band, Panama Rex, providing the soundtrack. The main event began with a barefoot Jimmy strolling onstage and jumping in to Changes in Latitudes, Changes in Attitudes and moved efficiently through the set’s 26 songs, interweaved with stories and reminiscences. The man really knows how to put on a show, blending musical styles through the night, from a jazzy Pencil Thin Mustache, to a country flavored It’s Five O’Clock Somewhere, to the steel drum calypso One Particular Harbour, to a bluegrass version of Gypsies in the Palace, all stamped with that distinctive Buffett sound. Not one to keep the spotlight to himself, Buffett recruited opening act Caroline Jones to join the band onstage twice during the show for Come Monday and Margaritaville. 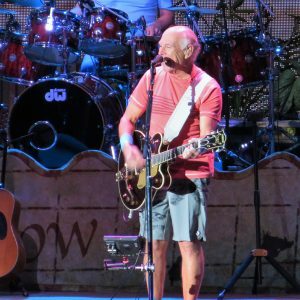 Even at 71, Jimmy Buffett is showing no signs of slowing down. Coral Reefer guitarist Mac McAnally also got his chance to shine, performing a solo rendition of the Allman Brothers Band song Little Martha and handling lead vocals on his own song Back Where I come From. Buffet, 71, spent most of the night referencing Baltimore, giving a shoutout to former Orioles athletic trainer and Buffett fan Richie Bancells who was in attendance, offering him a job at his new retirement community. He also talked about opening for Frank Zappa many years ago in Baltimore, and performed a first time live version of Beautiful Swimmers, a song about blue crabs and Marilyn Monroe that references Baltimore and the Chesapeake Bay. Many of the visuals also showed scenes of Maryland landmarks and sailing heritage. Buffett returns to the area this summer with a stop at Jiffy Lube Live in Bristow, Va., on Aug. 4. Despite what Jimmy said, it was actually his second performance of Beautiful Swimmers. He played it in Bristow, VA back in 2009. ← Six months after the Las Vegas massacre, what do we really know?